Contains high amounts of rice bran, a superior exfoliant that doesn't tear skin like botanicals can. Non-greasy, non-oily moisturizers such as rice oil and jojoba oil are extremely well absorbed by the skin. Pleasant and natural aroma from All natural formula, no chemicals or artificial fillers. 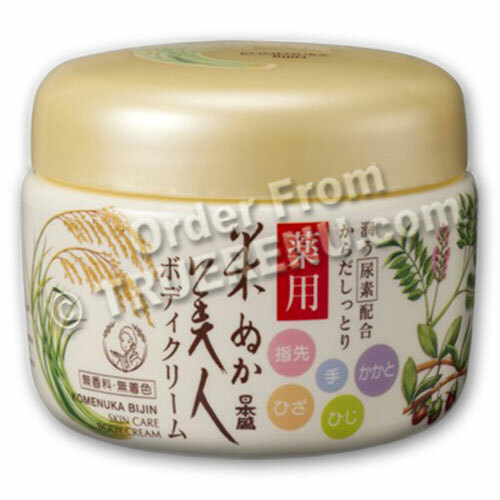 Komenuka Bijin Body Cream is an all purpose moisturizer for all types of skin. Great for rough elbows, knees, hands, feet, and/or entire body. Good to use after shaving. Ideal for baby's diaper change. If you're looking for a safe, all-natural, and effective anti-aging regimen you've found it in rice bran - a centuries old beauty regimen and the secret of the ageless Japanese complexion. With clean hands, apply on rough, chapped or irritated skin areas. Many customers love to use it as night cream or after shaving. Ingredients: Rice bran, Rice oil, Glycyrrhiza, Jojoba Oil, Aloe, Sweet Basil, Silk Extract. Product Size: Net Weight: 140g, or about 4.9 ounces.